heartbreaking news for the Indians regarding Michael Brantley was revealed on November 9, though clearly Michael knew this was going to happen well before it was announced to the public. the Tribe made it known that earlier today Michael had arthroscopic surgery on his right shoulder to repair a slight tear of the labrum--a circular ring of cartilage (or piece of rubbery tissue) attached to the rim of the shoulder socket that helps keep the shoulder in place. Dr. Craig Morgan performed the procedure in Wilmington, Delaware. Michael will be sidelined for 5-6 months and is undoubtedly going to miss the beginning of 2016.
this surgery could be avoided, it's not a total surprise that he wound up needing it anyways. Michael's season concluded early when he was officially shut down on September 30 because of his inflammed right shoulder. he initially injured his shoulder when making a diving catch attempt in the game on September 22 against the Minnesota Twins. he left that game early, missed the next 4, then played 2 games before it was decided that Michael would receive a cortisone shot, prematurely ending his 2015 campaign. as Terry Francona disclosed, the plan from that point was this: "the cortisone shot will effectively shut him down for the season, but it won't shut him down. what he's going to do is, when the rest period (from the cortisone shot) is over, he'll ramp it back up just to make sure everything is feeling good going into his offseason. that will be a week, 10 days away, just so that we know going into the offseason [that] he's not fighting that and can go back into his normal program." unfortunately, things did not go as planned. Michael's 2-week training schedule included strengthening exercises and an eventual return to light hitting. during this postseason rehab, his shoulder discomfort lingered, with persistent pain when he tried to take batting practice in mid- to late-October under the guidance of the club's Sports Medicine staff. Michael then requested a second opinion, so he went to see Dr. Morgan and found out his best option was the surgery that he had today. "he did everything he could to avoid surgery," James Quinlan, the Indians head athletic trainer said. "as time went on and he went through this program and hitting, he did a great job of balancing that out, and he put everything into avoiding the procedure but realized he wasn't where he needed to be. that led to where we are today." now before everyone rebels and asks why didn't they just do this surgery at the end of the season, read on. other baseball players with similar shoulder issues have had success with the program Michael followed. Quinlan noted that any shoulder injury is challenging because it comes down to the individual. "when we saw his labrum tear, there's obviously some thought that surgery would be a possibility. but we've seen in the past that a lot of guys are able to get through [it with] conservative management. really, you let your symptoms dictate that. so sometimes it's just something that you have to go through, a process of strengthening and rest and, if the symptoms subside, then you know you're in a good spot. if they don't, you're balancing out how much strengthening you give it versus the fact that he needs to be ready for a full baseball season. "you have a certain amount of time to work with and [Brantley] did a great job of trying to balance that out and get through with the conservative approach, until it got to a certain point where he knew that he was going to need to get something done so he could be his normal self." Michael will rehab for a portion of time at home in Florida, but much of his offseason shoulder rehab will occur in Cleveland in order to stay on top of his recovery under the watchful eyes of the Tribe's medical staff. then when ready, Michael will fly out to the team complex in Arizona, arriving before position players are required to report to spring training, in February. the most jarring news is he will not be allowed to swing a bat for approximately 4 months (which would put us at March 9, coincidentally my birthday). "some of it will depend on how his strength measures out when we get into January. the doctor estimates he'll be able to start swinging the bat around the 16-week mark, about four months or so. hopefully, that's around the beginning of March," Quinlan confirmed. he further shared, "our goal is to have him ready for the start of the season, obviously, but we need to be prepared for this to carry into April. that will depend on how his body responds. we don't know how each individual feels and responds and how they feel along the way. so we need to be prepared for him missing a part of April." if you're looking for a silver lining, the shoulder he had the operation on was his non-throwing shoulder. sadly though, Quinlan added that that wouldn't make much of a difference. "the rehab would probably be a little longer if it was his throwing shoulder, but it's his lead shoulder for hitting. so from a rehab standpoint, it's almost just as stressful because he has to follow through with his swing. so he really has to be strong with initiating his swing and follow-through." like i said earlier, this surgery didn't come completely out of the blue. however, some quotes from Michael after his early shut down emerged today that i hadn't seen before. here is what he said in late September: "nobody ever wants to go under the knife. as it stands right now, we're headed in the right direction. we have a great gameplan. i feel like i'm going to have a healthy, successful offseason and come into next spring training ready to rock." as you'd expect, Michael was not happy with all the time he had to miss in 2015. "the competitor i am, i wanted to be out there," he declared. "you've got to listen to your manager, the doctors, the trainers and listen to what they say, take into consideration that as well. deep down inside, any game that i miss, i want to be out there with my teammates." it goes without saying, he's going to be devastated when April 4 comes around and he's not playing with the Tribe yet. the 5-6 month timetable means Michael could return to REHAB games in the minors sometime in April and/or May. and he's going to need them considering he'll have missed out on his entire offseason regimen as well as all of spring training. i do have concerns about this leading to a rough start for him when he finally does return to major league games. Michael is a smart enough hitter that i'm hoping a little rehab will be enough for him to be ready to play well for whatever amount of time he can in the regular 2016 season. but it's not going to be an easy road for him. he will face more adversity this season than last season, oddly enough, and i'm sad for him. i did have a weird feeling that something might have been up with his rehab. i actually inquired about whether Michael had surgery to my TWO top Indians sources recently, and both of those guys avoided my inquiry. history has shown me that no news doesn't always mean good news, so i remained a bit concerned, but not overly worried. now i'm worried. when this news broke, my mind went into a tailspin. i wanted Michael to recover quickly and have a good offseason so he wouldn't come to camp with an injury again. instead, he'll still be rehabbing an injury when camp starts next year. and of course, the stats gal in me couldn't help but think he's probably not going to be a qualifier in 2016, which will take him out of the running for many potential season accolades. no, Michael doesn't give a hoot about that, but i love when he wins stuff because it's solid proof of how amazing a player he truly is. additionally, he may miss out on playing in the All Star game for the second straight season. yes, i'm already thinking about that, and it really makes me sad for him. truth time. am i bummed that Michael won't achieve as high of stats because he's not going to play a full season in 2016? yes. and am i scared that his shoulder might hinder him now for the rest of his career? yes. i'm terrified because that would be awful for him. but i can't dwell on that right now. what's most important is that Michael gets through his recovery. we'll worry about everything else after that. so where does this leave the team? 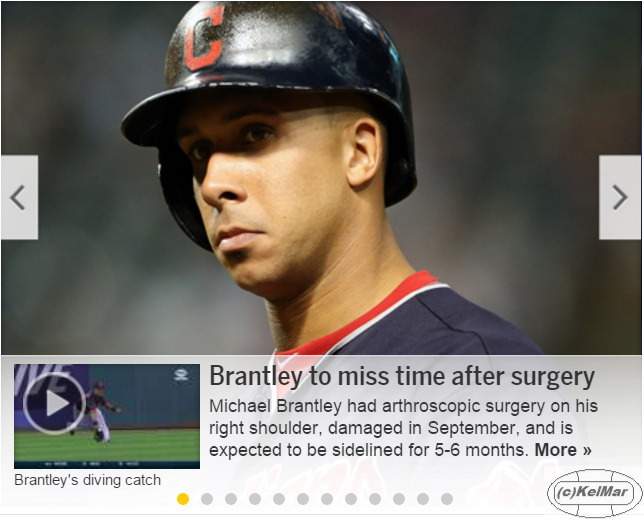 though this is not Michael's concern, his injury really puts the Indians at a quick disadvantage for 2016 presently. not having his bat in the lineup right out the gate is a problem. they might have to consider trading one of their top pitchers, something i don't think they originally wanted to do, in order to find an outfielder to take Michael's place while he's still rehabbing. and once Michael comes back, that pitcher we traded is still gonna be gone. so i'm definitely nervous about upcoming offseason acquisitions. things were bad enough with us being down to just 3 OFs (Lonnie Chisenhall and Abraham Almonte, both question marks in and of themselves), and now we're down to TWO. yikes. the Indians sure won't bring Michael back any sooner than he's ready, nor should they. based on what happened early last year with Michael's lower back strain, they need to be absolutely sure he's good to go before he's activated this time, regardless of the team's needs. and speaking of, can you get over how his shoulder ended up being more of a problem for him than his back strain? i never saw that coming. i feel bad that there's literally nothing i can do other than wish Michael a speedy recovery. it's strangely ironic that on the day i found out i would not need surgery (it was a serious possibility for me for a while), Michael had surgery. believe me, i'd much rather it have been me than him. he didn't deserve this. now, you might be wondering, what does this mean for the state of my Brantley blog? well, despite the fact that i'm not going to have a Spring Training #s blog to write for Michael in 2016, i will continue to blog what i can. when he goes out on his rehab assignments, i will compile a blog with those results and post that when appropriate. and be sure to keep up with me on twitter all offseason, @clevelandgirl23, as i will be tweeting and re-tweeting every update about Michael's health that i come across! special thanks to Paul Hoynes, Jordan Bastian, and T.J. Zuppe for the quotes and details about Michael's surgery. What Is Labral Tear Shoulder Surgery?